If you are new to me, hello I’m Christina Merkley. 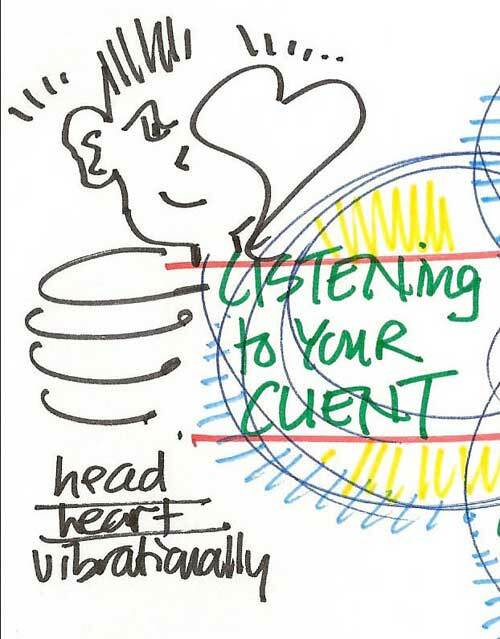 I’m a seasoned Visual Practitioner and teacher of various process skills including Studio Work, Graphic Recording, Graphic Facilitation and Graphic Coaching (which are related but different approaches). I teach all sorts of Process Professionals who work with groups and/or individuals how to weave “Working Visually” into your process toolkit. I teach both in-person and online and work with practitioners from across the globe. 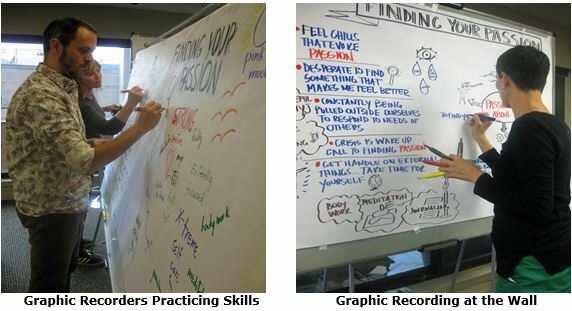 One segment that I teach and mentor is those working (or wanting to work) in the Graphic Recording industry. 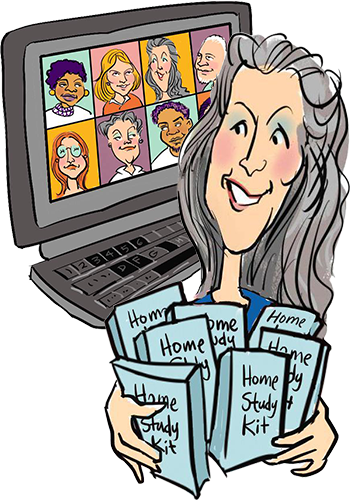 Graphic Recorders or ‘scribes’ work alongside a client group and/or lead consultant or facilitator and provide supporting visual summary (i.e. take useful notes in a visually pleasing way). Sometimes these professionals may call themselves Graphic Facilitators but in my books that is erroneous as a Graphic Facilitator is a different role from a scribe. For more information about these distinctions, see my video on 4 Main Ways to Work Visually. Like any new skill you have to practice, practice, and practice to get good at it. As discussed in my trainings there are plenty of things you can do on your own to practice these skills. However, there also comes a time where you need to get out there and do this in public wherever you can. The ‘only way out is through’ as I’m constantly saying. Do not worry about charging … to begin with the most important thing is that you ‘do the work’ and develop your skills and confidence. The money will sort itself out over time. Read Why Working for Nada Is Smart. And get Business Essentials for Process Professionals for detailed specifics and case studies when you are truly ready to monetize. While not everyone in the field will be your best friend and some will view you as competition it still makes sense to network with as many practitioners in your area as possible. Local practitioners may be kind and share location of resources with you (where to get paper locally, who is a good scanning vendor, a score on good markers, etc.). Plus, inevitably they will already be booked sometimes when more inquiries continue to come in … so they will need to refer to someone they ‘know, like and trust’. This could be you. If you are in an area where there are no practitioners then get involved online via the Graphic Facilitation Facebook Group (erroneously named given its mostly Studio Work and Graphic Recording that is shown in there, but hey), my Working Visually eCommunity (for grads) or travel to the International Forum of Visual Practitioners yearly conference (it heavily leans towards the Graphic Recording side of the field). 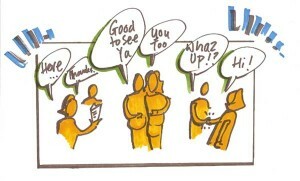 Don’t limit your networking to other Graphic Recorders. As a scribe yourself you should always be on the lookout for those who need your services. Contact companies, not for profits and government agencies in your area and introduce your services (offer to do a demo at an upcoming meeting). Go to local event facilities and conference centers and introduce yourself and your services to those who book meetings. 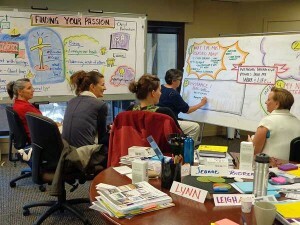 Again, offer to do demos so they understand your service if they have never seen Graphic Recording in action before. 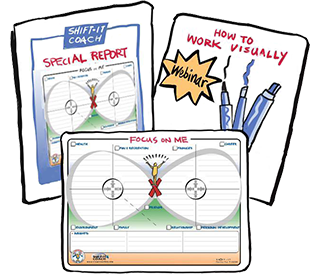 Also, find out ‘who’s who’ in consulting and facilitation in your area — as consultants, facilitators and project leads of various specialties could benefit from your Studio Work and Graphic Recording support at times in their own gigs. Plus being in their rooms will teach you A LOT about process work (which you may want to grow into down the line … become a true Graphic Facilitator). Good work begets more work but don’t make the mistake of resting on your laurels especially if you primarily work for one or just a few clients … as that leaves you vulnerable should something happen to them. It’s smart to diversify and consistently ‘touch’ your network on a regular basis to remind them of who you are and what you provide. And update that as you morph and change over time so they don’t get stuck thinking of you in just one way. You will need to create at least a ‘good enough is good enough’ website. Think Version 1.0 which you consistently revise as your expertise and portfolio develops. And I also advise that you make good use of social media which ‘working visually’ is a natural for. Choose a channel (LinkedIn, Facebook or Twitter) that you like and that your target market uses. And consistently post … you will be rewarded for that in a multitude of ways (jobs, referrals, help in other ways, etc.). I’m a big fan of developing a database and writing to them on a regular opt-in basis (like through a blog or eZine … I’ve been doing my SHIFT-IT eZine and blog since 2005). But don’t start it unless you are going to keep up with it. Nothing screams ‘slacker’ like a blog that hasn’t been touched in months or years! If that is the case you are better off just taking it down. Not everyone is going to love you or your work all the time. The sooner you accept that the better as I’ve seen too many sensitive people attempt to do this work but crack at the first obstacles they encounter. There are obstacles in life. 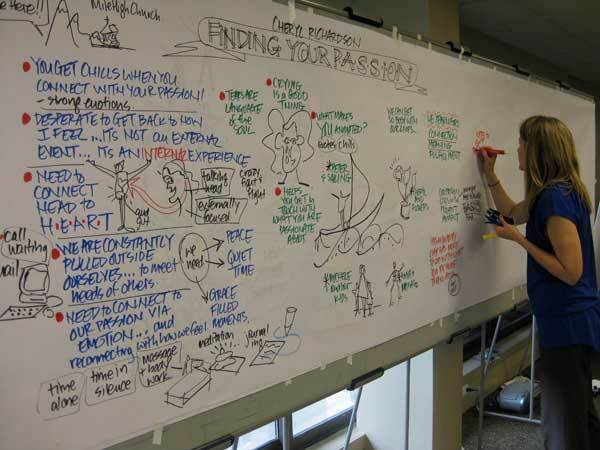 There will be obstacles in your Graphic Recording career too. Not every chart, recording or job is going to go perfectly. On occasion, some people may be downright nasty or cruel. It behooves you (even if you are a sensitive artistic type like most of us in this field) to grow a thicker skin and also be willing to listen to and respond to feedback when appropriate. Some of what is said will be more about them than you (hello, can you say PROJECTION). However some things will be legitimate feedback you need to take in and humbly digest. You may need to adapt your work or style to suit what clients want and not just what you like. You may have to put way more research into your subjects before you attempt to record them. You may need to really develop your drawing skills if it’s highly illustrative in your area. Or, if you just can’t reach that artistic level (or don’t want to) you may need to move into the other areas of this field where the onus is more on the design and execution of effective process work than it is on high-end illustration. Fundamentals of Working Visually, Magic Marker Retreat, Private Training and Private Coaching. Improve Your Inner Game: confidence, strength, visibility, positivity, overcoming fear and comparison-itis, etc. See SHIFT-IT Online and Practical Energy Work. Business Essentials for Process Professionals.